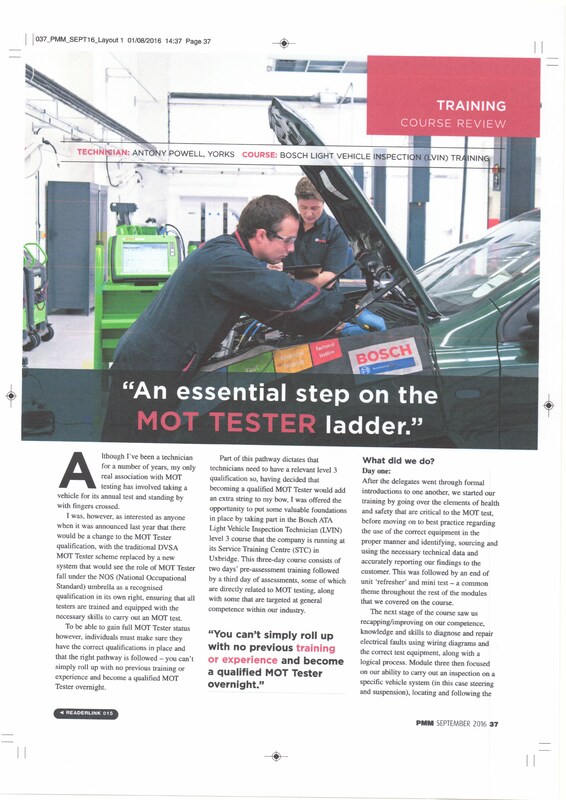 This article was on the new MOT tester training course that's now required. I received this tool from Sealey, On loan, as a test unit for Professional Mechanic Magazine, for me to test out and report on its performance etc. Many of us have to start cars or vans with flat batteries on a daily basis and the days of dragging a trolley with a truck battery or two and some heavy duty jump leads on it, around the yard have long gone. modern jump boxes put paid to that some time ago and this is reputedly the next step. Prices found from a quick internet search showed the EStart800 to be selling at just over £100 inc vat at best, making it very competitively priced, but be careful I did find a shop soiled and a Start600 version on sale for more money. The unit is supplied with a 12 volt accessory plug, charging lead, A micro Usb charging lead and a storage bag. It also comes with a 12 month warranty. First impressions were good at 5 x 8 x 2 inches in size (120 x 200 x 50 mm) and 3 lbs or 1.3 kilos in weight approximately, This light but chunky looking rubber wrapped little box hides a powerful punch of starting power. The leads allowing for 17 inches or 400mm between battery terminals. Unfortunately the 12 charge lead is a little short and charging the unit from an accessory socket whilst driving would be impossible in most cars or vans as the lead won't reach the socket with the unit on the floor, in the foot well or laid on the passenger seat. Also the thin storage bag probably won't last 2 minutes in a workshop environment before being either discarded, lost or torn. My first test was a 2.0 ltr Renault traffic, The driver had left the inverter turned on overnight flattening the battery. I plugged on the little box and pressed the on/off button, A row of lights lit up giving a voltage reading of 7 volts and they slowly began to climb the scale one by one as the unit charged itself, a short while later, well within the two minutes Sealey claim, I had the two green lights and 14 volts the instructions state are required, so I turned the key and the van started as though the battery was fully charged, A very impressive start I thought !! The first point to note is that it can charge itself from an almost totally flat battery or can be pre charged from a nearby donor vehicle in minutes, (If you pre-charge it, it can hold this charge for a couple of days according to the instructions). How many times have you carted a heavy jump pack or dragged an old fashioned trolley with a couple of large batteries on it, to a vehicle only to find the last user didn't put it back on charge ?, I have, too many times over the years. Secondly being small and light in size the effort of taking it to the van was negligible and a lot quicker than with older ways from the past saving money in wasted time is always a bonus. My second test was a Toyota Prius Hybrid, This car had been stood for some time and the small 12v battery was flat, even after pre-charging the unit I got no ignition lights where as a normal battery booster initiated lights and a prompt start up. After moving the car into the garage and turning it off the same response was found on a second attempt. I may have found this units Achilles heal !!. After later referring back to the instructions there may be a way around this but the Prius battery had been charged up in the mean time so I couldn't go any further with it. Reading the instructions later I found that the unit could be used to replace a dead battery by disconnecting the battery leads and substituting the unit. Attempt three was another Renault Traffic with the 2.0 ltr engine and this was started without issue after the driver left the ignition on and the heater fan running. Moving on to test four a Honda civic again started without issue in barely a minute, in fact it took longer to find the bonnet pull !! Using this unit over the winter months has proven very useful indeed, the unit has repeatedly carried out the starting of many vehicles with flat batteries and even some with totally dead batteries where the unit was used as a substitute power supply allowing vehicles to be driven back to the workshop for a new battery to be fitted. Although the unit it rated at 2 ltr diesel and 3 ltr petrol we have used it to start a 4.2 ltr Range Rover without problem. The unit has performed flawlessly and proven itself time after time, we have now had this on trial for several months over the winter period and after many, many further boost starts on miscellaneous vehicles the unit is still performing well. it has now become our workshops No1 go to jump start tool, mainly due to it's size and weight but also because it works !!. We did an injector change on a Vauxhall Vivaro and when it came to start it was flat having been stood for some time, we would normally use a mains booster to give us the power needed to spin the engine over long enough to bleed the fuel system and start the vehicle but decided it would be a good test on how long the unit powered the starter under load. Once again this little box performed and after what seemed like a long time the van sprang into life. Another excellent performance. Due to this it now lives in our service van and gets used almost daily. The instructions do say it will hold a pre charge for a few days and we have found this can be up to a week on a couple of occasions. Finally we had an alternator fail our van and the battery died late at night only 500 meters from our base and the van cut out, we used the box to boost the battery to start and left it connected, it gave us 100meters of movement before the van cut out again so after 5 goes we made it home. I think that was really the ultimate test and based upon the performance of the unit have purchased our own. The unit has worn well and all the clips, covers and trim is still intact and shows little wear and tear always a good sign, no problems and continued use prove this unit to be a good investment for all. for the small cost of purchasing one, every garage /sales yard and showroom should take the plunge and buy at least one in our opinion. We highly recommend it. 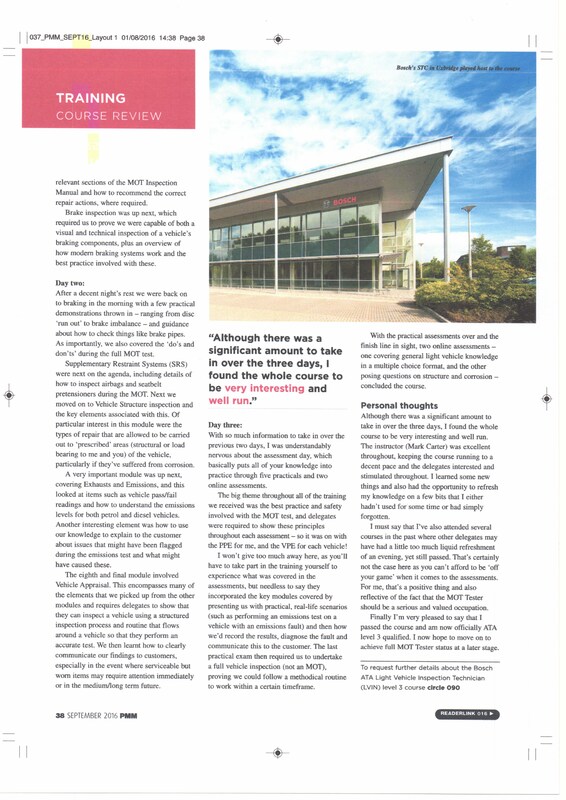 I own and run A P Autodiagnostics Ltd a mainly mobile repair service and have had the opportunity to test the latest 4 channel Picoscope Oscilloscope Kit over the past few months thanks to Professional Motor Mechanic Magazine and here are my thoughts and findings on the tool. Having owned a Pico scope for many years I was very interested to see the advertised improvements made, Many tools I've owned profess to be "Improved" but I have found that many aren't, the pico unit though lives up to this title very well. The Picoscope was supplied with a robust and comprehensive box full of leads, and a software set up instructions disc, But you need to provide the computer and screen to see the images on. A cheap laptop is ideal and the unit then becomes portable if required. powered by the laptops battery but not taking too much out of it so as to flatten it quickly. The main difference upon opening the box was the 90 degree rotation of the unit and the massive selection of leads and connectors, This could have been a little daunting for a first time user but you soon find out what's what. when it came to connecting the unit and Loading the latest software I found my first problem, Pico have changed to a later and faster USB3 lead. I use an extended USB2 lead to a laptop connected to a large monitor on the wall in the workshop and a large screen laptop when on site, it makes things a lot easier to see, especially from the drivers seat, A massive advantage over the hand held scopes as no detail is lost to a tiny image, and its in full colour! Anyway once that was sorted (I moved the scope closer) installing was a breeze and no problems arose which was reassuring as I'm not the best at sorting out pc issues. The unit quickly sprung into life and with the latest updates installed off we went. Oscilloscopes are a very simple tool giving a voltage versus time image yet many people find them daunting to use. this initial fear is very easily overcome using the pico and spending time playing with the unit gives you much more confidence very quickly (especially if you do it after hours when no ones watching) and even pleasure when you get it right for the first time. Connecting the leads is the first real obstacle, where do they go , how do I connect them ? followed by what settings do I need, all things that the pico unit's software shows you how or where to do with ease, giving simple instructions and setting up the basics for you. so if you are a new user of simply a rusty old one you can get usable images very quickly. Once I began using the unit I immediately noticed a big difference in speed the new unit was much faster than my old one (up to six times faster according to Pico's website) and the images seemed clearer or was that my new glasses!. very important on some testing. I firstly tried the instructional section of the software which when you are new to the Picoscope or oscilloscopes in general is an absolute godsend, Again the software gives you an easy to read description and guides you through where to connect the leads and shows what settings to use then shows you an example of a good image and what to expect, then when you click the button it sets up the scope for you ready to use, All you have to do is connect the leads as directed. I really found this to be a major point when I first got my scope as after attending the training course still found the whole subject quite daunting until I did some out of hours playing myself. The scope software was familiar to use but still had that new feeling about it, and after playing with the easily adjusted settings and screen colours to suit my taste I was on to my first job, This was a Renault Megan with intermittent non start, After a quick code read revealed a code showing crank sensor faults, I did a simple scope set up onto the cam and crank sensors and it quickly showed some very untidy signals from the crank sensor. Upon quizzing the owner before work began, I found out he was a bit of a DIY tech, I was informed a new sensor was fitted only three days ago based upon his Google diagnostics with little change. "so it must be something more complicated like the ECU at fault he said." Upon returning to the car after being distracted by another customer, It had decided to become a non start and the signal shown by the pico was un recognisable, after checking the wires etc A new OEM sensor was fitted and it sprang into life, I tried it several times throughout the day and all was well. The customer was surprised that the fault was repaired so easily and went away to return his not so cheap after all purchase to the local car shop. cheap part get a lot more expensive when they don't repair a vehicle as many of us know from experience. The next job was a Nissan Primastar with injector issues, As we specialise in the removal of seized injectors taking on this job held no fears for us as it does for many garages, the 2 litre M9R engine was typically running sweetly as I drove it into the workshop, A code read revealed several individual and injector bank faults. This rang alarm bells as the injector failure on these engines is usually quite code specific. so out with the pico again and after stripping the vehicle for access and setting up the amps clamp a good signal was found on number one cylinder, by this time the engine had warmed up a little and the misfire was becoming more obvious, moving the clamp to cylinder two the image became weaker and intermittent and the fault got worst. Moving onto cylinders three and four showed slightly different images but similar faults. Having now done thousands of these vans I was convinced that this was not an injector issue as reported by the code reader but a wiring issue. We have done many of these and I had a good idea as to where the fault lies and after stripping off the front end of the van to access the harness I found what I was looking for as shown in my library photo. the harness had broken down allowing the wires to corrode and causing the misfire. A quick harness repair and all was well again. This fault shows the big advantage of the oscilloscope by proving a fault before swapping parts and when you use it regularly it becomes like your third hand, setting up becomes much quicker and proving faults before swapping saves both time and money for everyone. The fault codes on this van could have lead the less experienced into swapping three of the four injectors, a very expensive job which could easily have backfired but using the scope it clearly showed the injectors were not at fault, you can't believe everything the code reader tells you and the simple voltage over time images provided by the pico don't lie. From quick and easy compression testing / battery testing and numerous other simple tests to can bus and timing chain or VVT checks the Picoscope covers them all and is a very universal tool that actually fits its role and does the job perfectly. The backup provided by pico is excellent, I had occasion to send my own unit back for repair (out of warranty) It was returned within the week fully repaired with no charge, not even the postage. you can't ask for better than that! Software updates are fairly regular and free, yes free for life no more update charges with this one!, there is a very extensive image library showing loads of good and bad images to be found online from Pico's site and many others. Pico send out regular news letters that actually have some interesting and useful content in them and offer some excellent training on the use of the scope through approved training centres. There is also a massive and very useful network of online websites, you-tube video's and books on the Picoscope and how best to use it. The Picoscope is approved and used by several of the top vehicle manufacturers and the software can be downloaded for free from their website, you can use it and see for yourself in a demo situation of course. After assessing the new scope for several months I am very impressed with the it, both the speed and memory size being among the biggest improvements. I would like to see the ability to have separate triggers for each channel but after approaching pico on the subject was told that this wasn't in the pipeline, lets hope it gets there soon, at least it was an honest reply and not an "it'll probably be in the next update" style answer that you get from some tool suppliers. The Picoscope is a definite requirement for anyone looking at diagnostics in a garage environment and after trying several other scopes I personally think its the best, price is very reasonable as well coming in well under two and a half grand for the top of the range kit (even if you buy a laptop to use it on as well). Money well spent in my opinion.